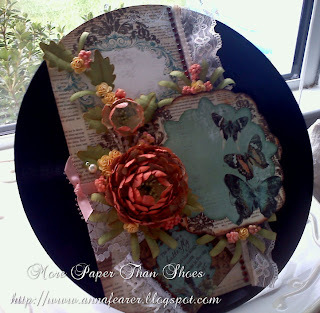 Tri-fold mini Screen - demonstrating a Faux Velum technique featured on the "Free Style Crafting" channel hosted by Fiona. I am on her Design Team, with 5 other lovely and talented ladies, where each month we will submitt a new tutorial on using everyday house hold items to craft. This is my second month and I am having a great time "Thinking out of the Box" as Fiona would say. If you have time come on by the Free Style Crafting channel on You TUBE and check out what we are doing. Anyway October is a busy month for me I have many swaps going on right now at the same time not to mention all the RAK's I have to get caught up on! It's also my Grandaughter Tori's 15th Birthday month and I'm behind on getting her birthday gift finished! But I have finally finished it! It's a baby Grand Piano Jewerly Bos that I made fro chipboard and my own hand drawn pattern. I hope she likes it. Please, Please excuse my horribly messay desk! Her favorite colors are similar to mine...Black and Purple. I had a great time making this Piano for her and I'm really suprised at how it came out! I like it! I drew all the piano keys on whitc cardstock using a ruler to draw them out. I also used some Martha Stewart Glitter paint that I purchased at Home Depot, I really like those paints! They are a little pricy but very beautiful and glittery! Yup another great Give away!!! This beautiful album can be yours if you win! all you have to do is go over to Anna's blog, be a follower and Tell all your friend Bloggers - by speading the news and posting the giveaway on your blog for a second chance to win!!! Craftyloopps is having a Blog Candy giveaway!! Go on over to her blog and give her some love! She is giving away lots and lots of Yummies! just Click on the link for a chance to win!